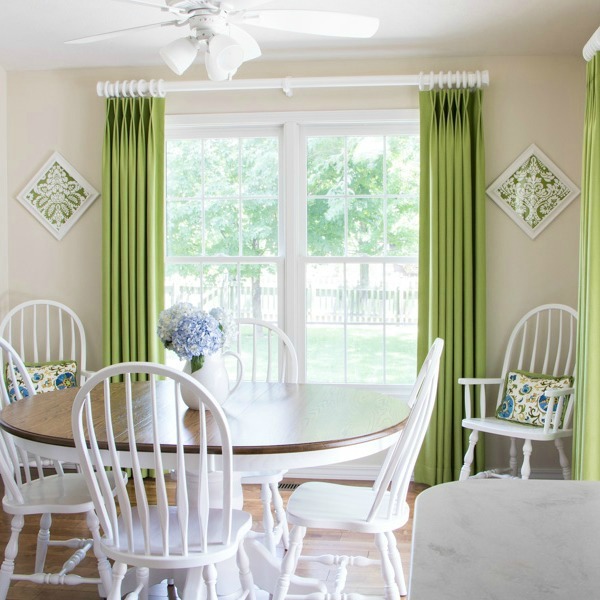 Probably the most common comment that I hear from my clients is that they don’t want their new window treatments to cover too much of the window glass. Or, in other words, they don’t want to block any of the view out of the window. This doesn’t have to be an issue. You can have beautiful draperies at your window, without covering the glass or blocking the view. It’s all in how you hang them! 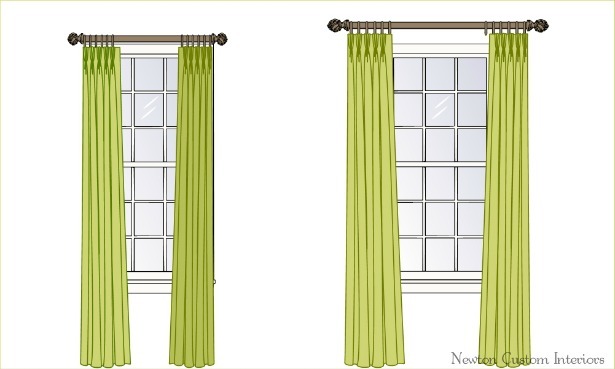 I’ve created pictures of draperies at a window to show two different ways that you could hang them. The 2 windows are exactly the same size. On the left, you can see that the draperies are hung right at the edge of the trim, and cover a lot of the glass. The drapery pole has been hung right above the window trim. 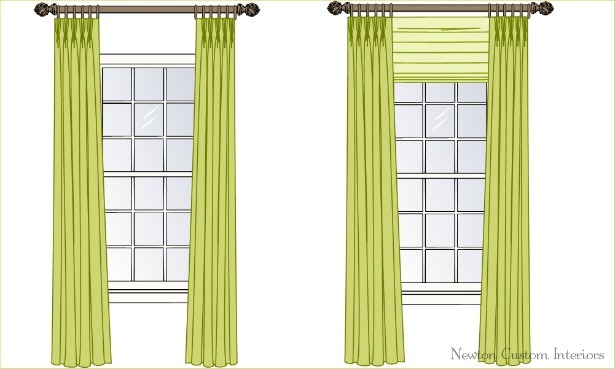 On the right, is an example of draperies hung outside of the window, on the wall, so that the leading edge of the panels just skims the glass area. See how much larger the window looks? The drapery pole is hung higher, half way between the ceiling and the top of the trim, in the picture on the right. This also helps to make the window look larger. In the example below, I’ve made the panels sheer so that you can see how they relate to the window area. I also wanted to touch on the topic of how high to hang your drapery pole. Personally, I like the pole to be about half way between the ceiling and the top of the trim. Especially if you have 8 foot ceilings. To me, that is the most pleasing to the eye. One of the current trends is to hang the pole at the ceiling. This can make the ceilings looks higher, but my eye always goes right to the blank wall space between the pole and the top of the trim. Especially if the ceilings are higher than 8 feet. Below you can see that both drapery poles are mounted at the ceiling, but I have added a roman shade to the window on the right. See how it helps cover the blank wall space? In my opinion, a much better look. In our dining room, I made drapery panels for the windows. The drapery panels come out on either side of the window, and hang in the wall area. So, not much of the window glass is covered. 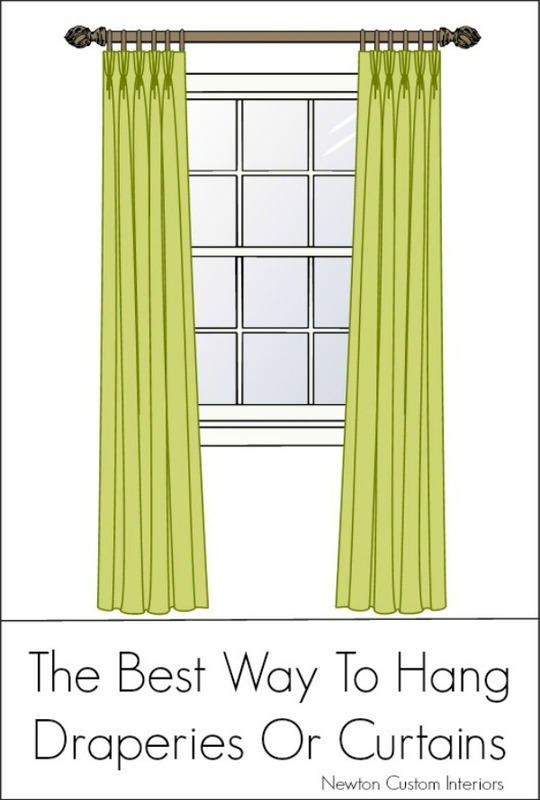 I hope this helps if you have ever wondered where to hang you draperies. What do you think? Do you have a preference? I would love to hear what it is. Thank you so much for addressing the blank space between the rod and the window frame. I never paid much attention to it until a friend noticed it. Of course then it really bothered me. What color??? Match curtains trim upholstery?? Thanks Cheryl! I’m glad you found my site! I would choose a complementary color that’s in the drapery fabric if it’s a print. 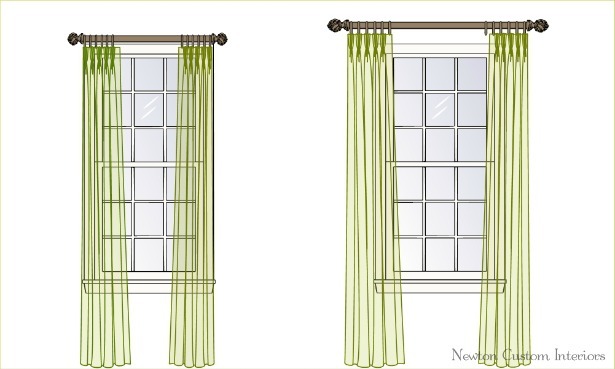 If the drapery fabric is a solid, then a complementary color or the same fabric as the drapes. i like your ideas and renderings. I am having difficulty with eyebrow arch window. We are building a house with this type of window and I am having difficulty with the window treatments. We would like some sort of horizontal blinds, but cannot figure out what to do with the arch at the top. Any suggestions? Stephanie, thanks! I have an eyebrow window post in the works. Stay tuned! I love the pleats in your curtains. What is this pleat called? Rita, thanks! The pleat is a two fold pinch pleat. The traditional pinch pleats are 3 folds, so this is kind of an updated look.